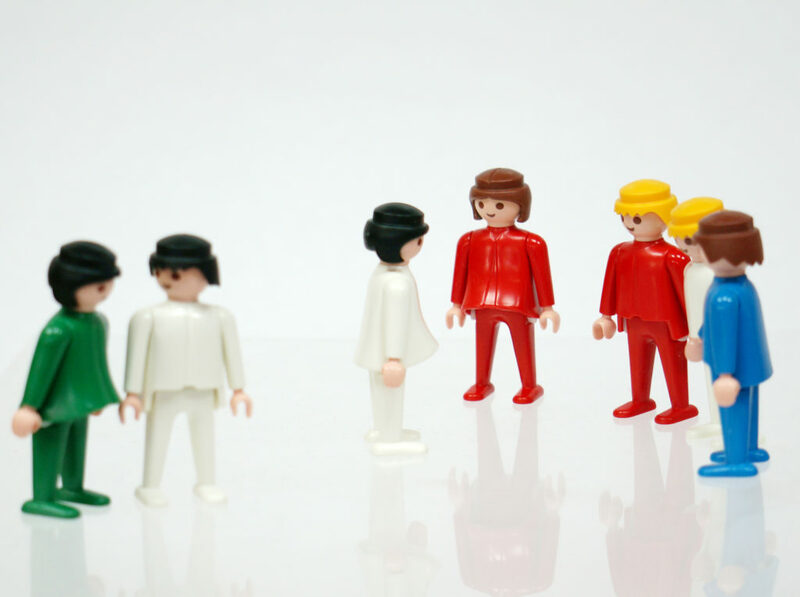 The figures from „Playmobil“ are a well-loved set of playfigures, that have long been present in the room of nearly every child. They are increasingly used for representing relationships spatially in therapeutic settings, counselling and consulting. 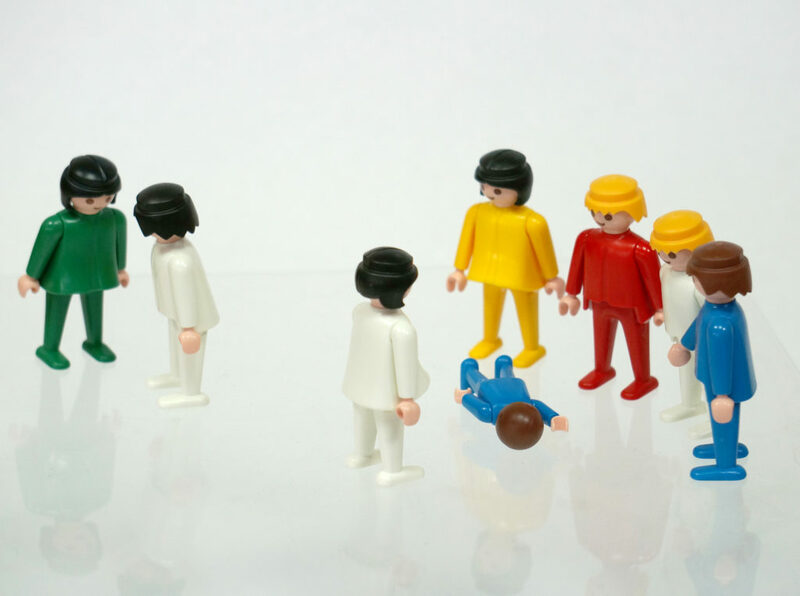 The experienced German counsellor Sieglinde Schneider worked together with the manufacturer to especially design and develop this well-tested figure set for therapeutic and counselling interventions. This set is equally suitable for constructing family constellations in individual therapy as it is for coaching and counselling, or for consulting teams and departments in an organization. 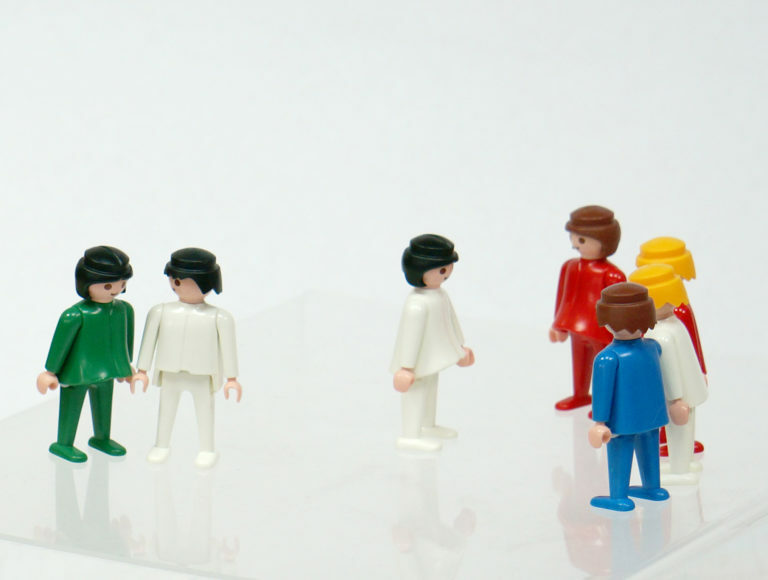 The forty figures (15 men, 15 women, 5 boys and 5 girls) are immediately distinguished from the well-known play figures by their outer form, color and size. Five distinct colors allow the representation of different family, team or other system relations. Differences in clothing and hair color are also possible to allow for further differentiation. Differences in size allow the representation of adults and children, as well as hierarchical levels within an organization or company. The figure set is light, and therefore can also be used for external counselling appointments, workshops and training. Sieglinde Schneider has used the figure set for a long time with great success in individual therapy. The figures are well-accepted by clients because of their similarity to the human form. Working with this figure set comes closest to the intensity experienced in group constellations. Constellations of families and other systems have become well known in a group setting. This work and the related areas of resolution orientated systemic work and phenomenological psychotherapy have achieved a fundamental significance in psychosocial areas and are also having effects on various approaches in individual therapy. There are many therapists and counsellors working in situations which do not allow for group constellation work. There are also some who might not feel comfortable working in a group setting. Nonetheless, at a deep level, many of these therapists feel attracted to the underlying concepts and tools of constellation work and are looking for ways to integrate this approach into their work with individuals, couples, and families, or perhaps even small supervision groups. Constellation work with figures or objects provides a simple and direct method. The figures, representing family member or significant people in a particular system, are arranged on a table or within a defined space in the room. They should be figures that the therapist can work with comfortably. Don’t worry about whether clients will accept them. If the method and the tools are right for the therapist, clients will almost always concur. The figures should have as little ‘character’ as possible, thereby keeping any pre-conceptions to a minimum and also reducing any distraction from non-essentials. The figures are not important in themselves, but only as a spatial projection of the members of the system. Working with figure is easier if the figures allow for a few basic distinctions: for example, between male and female, some way to indicate the direction a figure is facing, and perhaps colours, or some marks that distinguish one person from another. Using smaller figures for children may be distracting as they could suggest an orientation towards a time frame of childhood and take away from the ‘timeless’ quality of the constellation work. I, myself, work primarily with groups and my use of figures in individual work is based totally on my constellation work in groups. I cannot imagine doing constellations with figures without any experience of group constellations. I believe that one needs experience with group constellations in order to work competently with figure constellations. This experience need not be working directly with groups doing constellations. I would recommend experience with a personal constellation in a group, and observing system constellations in groups, or videos of these which can provide some impression of what they are like. I know therapists and counsellors who work with figures without ever having led a constellation group, but I don’t know of anyone who would try working with figures without ever having seen a constellation in a group. In the next section I will go into detail about when a constellation with figures is appropriate, how I proceed in an individual session when I am using a figure constellation, how I introduce it to a client, and how I work with the figure constellation. I will then go into the risks and opportunities inherent in this method and finally, I will say something about figure constellations and ‘soul’ work and the value of the approach in this regard. Counselling and therapy are concerned with supporting a process that moves towards a resolution. Such processes may appear in a wide variety of forms. First, there are problems which can be resolved by changes in behaviour, through learning, creativity, and spirituality. Here the concern, to a certain extent, is with some kind of mental activity that releases the client from thinking and acting in ways that block resolution. Then there is the area of trauma, the deep wounds that usually have to do with a disruption of a loving, reaching-out movement towards one’s mother, father, significant others, or towards life itself. Such traumatic injuries most often stem from early childhood experiences. They can be resolved by a retroactive healing process in the soul between the child and a life-essential other. Finally, there is the broad area of bonding and releasing in relationships. Problems arise in a person’s deep bonds to a communal destiny and the consequences thereof, primarily within the family and extended family. Resolution is to be found through insights into the orders of love. Constellation work is focused on the processes of bonding and releasing in the soul. Resolutions emerge through looking at an entire relationship system. Everyone in the system has a equal right to belong and must be allowed to take his or her rightful place. Everyone carries their own fate themselves and each must refrain from meddling in the fate of others, and all the members of the system has to allow those things that are past to really be past. It has to do with life and death, good luck and bad, health and illness, successful and unsuccessful relationships, belonging and exclusion, giving and taking, recompense and debt, and with self-determination as opposed to being a pawn, subject to the influences in the system. In essence, these are also the criteria that indicate when a family constellation could be a helpful method: Whenever there is something in the ‘group soul’ that is in want of order, peace, or conclusion; when entanglements are hindering a process of resolution; or when a difficult destiny in a family is proving burdensome. Many therapists and counsellors will want to integrate family constellations using figures with their own way of working and with their own basic therapeutic orientation. For myself, when there are issues of bonding and letting go, I normally have only one session in which the work is concentrated fully on the figure constellation. There is, however, most certainly a wide variety of procedures. There are certain elements that are important in proceeding with a figure constellation. Just as in a group constellation, it is essential in an individual session that the constellation is dealing with a serious issue and is carried by the client’s energy. The therapist is dependent on this energy which pushes towards resolution and the ‘soul weight’ of the client’s question. As a starting point, questions about the nature of the issue at hand and then about what would be a good outcome provide the clarity and strength that are critical to the success of a family constellation. The therapist and the client need to know right from the beginning where to direct their energies. Both of them have to have some sense of the ‘group soul’ that will carry their efforts looking for a good resolution. The client’s real issue is frequently hidden at the beginning of an individual session, as is the strength that might have a positive effect on a resolution. Guidance is needed into the constellation work and the process in the soul that supports this work. This guidance should be rather short, leading immediately away from any side issues or distractions, steering attention and energy towards the fundamental family processes. and building trust for the work together. I usually comment briefly about my way of working, about entanglements in family systems, crises in relationships, and about what things I will be looking for. If I already have some idea where our work might be heading, I may tell one or more appropriate stories from other case histories. If I have no sense of which direction the work is going to go, it is sometimes helpful to offer a mixture of short examples and pay close attention to the reaction of the client. The basis for a step that resolve in a constellation is built from the relevant information: the most important events in the family history, the current family and/or the family of origin, and the fates of those in the family and clan. This information and the way the client shares it often lead to a deep movement through the relationship system and a first glance into the operative love, respect, and entanglements. Or, you may sense immediately what information has strength and what doesn’t. if something important has been omitted, or if the client does not have some critical information. This exchange of information is dialogic and both the client and the therapist need to have contact with the ‘group soul’. The process relies on essentials and exists in the service of resolution. It can be achieved only with respect and consent concerning the events and fates involved. The core of the systemic orientated work is the figure constellation itself: finding – actually allowing oneself to be touched by – the dynamics of the relationship system, rearranging the positions of the figures in a ‘picture of resolution’, and speaking appropriate sentences of bonding and releasing. When someone has already seen or experienced family constellations in a group or knows Bert Hellinger’s books or videos, a figure constellation barely needs an introduction. You can simply ask the client to set up their family members with the figures. Here too, however, as with people who are not familiar with family constellations, I refer to the group constellation work and briefly describe the course of a constellation in a group. At least for me, it simplifies the work if I work with the figures just as in a constellation with representatives. After I have established the connection between the figure constellation and a group constellation, I determine with the client which people are important—or initially important—for the constellation, and lay the necessary figures on the table. Then, I ask the client to position the figures in relationship to one another, without speaking or explaining, according to an inner image, without regard to any specific time, without any justification, but simply so that it feels right in some way. Most of the time, clients can set up a constellation with no difficulty. When problems do arise, they are usually no different than what happens in a group. It may not be the right moment to do a constellation because the client does not yet have the necessary inner readiness, or there isn’t enough trust in the method or the therapist, or what is actually called for is a constellation of a different system, perhaps the family of origin instead of the present family, or vice versa. This reveals one of the big disadvantages of individual therapy as opposed to group work. In a group you can work first with those who are ready. Others, who may be reticent, indecisive, or in doubt, can enter into the work slowly through the processes in others’ constellations, or by acting as representatives in someone else’s family system. They can take their time with their own inner process. If it proves difficult for someone to position the figures in relationship to each other, I sometimes do it for them according to whatever feels right to me with the information I have. I then ask the client to correct my constellation. If you have the impression that the constellation has been set up from some idea or if it does not concur somehow with the information given, or if all the figures are set in a line facing the client at the table, you may have to ask the person to check the constellation again. The difficulty mentioned last, figures placed in a line, occurs repeatedly but is easily corrected. Remind the client that he or she is already represented by a figure and the constellation has to reflect the relationship of each person to the others in the family. A figure constellation serves to reveal clients’ entanglements in the family system and to make bonds and resolutions clear. It allows the individual to take an appropriate position in the relationship network, a position from which is it possible to take in, honour and respect both parents. It permits the person to let go with love, to see who must be allowed to go in peace, and to take anyone who has been excluded back into a rightful place in the system and into the client’s heart. The dynamics of bonding and resolution have to be made clear by the figure constellation without the support of representatives’ feelings and feedback, since figures cannot feel and cannot speak. It is the task of the therapist or counsellor to use the figure constellation to feel into the system and express the feelings that reflect the family dynamics. Naturally, you can ask the client to do this himself, which sometimes results in an ‘Aha!’ experience. In my experience, however, clients are often blind to the essentials of the family dynamics. They do bring an unconscious understanding to the process or they would not be able to set up a constellation properly and the therapist would not be able to get a feeling for the system, but this unconscious knowledge is concealed. The task of the therapist, as an outsider, is to help the client’s ‘group soul’ open in such a way that what is hidden is revealed and can be spoken aloud. Right from the beginning, I present the concept of a group constellation as our working ideal and I base my comments about the family dynamics on group process. As an outsider, I voice my feelings in the role of each family member in a particular position. That is to say, I do not say how the family members themselves feel in this position, but rather what representatives would probably feel. I do this because it gives the client some distance from their dominant experience with family members and because it leaves me and the client more freedom to experience and take in what can be seen in the constellation. It also makes it easier for me to correct what has been said and to work around resistance. If what I say about the family dynamics and the feelings of the representatives hits home and touches something, the client will be in contact his or her family in a trance state of a greater or lesser degree. As I speak, I pay attention to the client’s reaction. Sometimes I ask if my sense of things seems right and makes sense to the person. When I succeed in getting into the system and its dynamics, the client is won over and usually nothing more stands in the way of working towards a good resolution. It is not seldom that a client asks with astonishment, ‘How do you know that?’ In the next phase, I continue to work with the figures just as in a group constellation. I change the positions of the figures, and say aloud what changes occur in the dynamics and feelings, until we can see what is attempting to reveal itself. I continue in this way until we come to an image of resolution. When I am certain, because of my own feelings of being touched and those of the client, I simply stay with what emerges and speak it aloud. If I don’t feel certain, I interrupt the process and ask what the client feels, in terms of self or other family members, in looking at the movement of the figures. I ask for further information or try different positions of the figures to determine which seems more correct. I continue until the dynamics and the solution are revealed clearly enough. I ask the client to feel into the position of resolution and report how that feels. I watch to see if this place is a relief for the client and if it appears to heal, to resolve, or to soothe. I sometimes stop the figure constellation at this point. I often call upon the sentences of resolution that would be spoken in a group constellation when the client replaces his or her representative in the constellation, or a sentence that a representative might say directly to the client. I do this when a client is experiencing difficulty taking his or her new place in the system or when the resolution we have arrived at does not yet ‘sit’, or seems to need further deepening or elucidation. Frequently, the most important part of the process in a figure constellation—as it is in a group constellation—is being touched by the sentences that reveal the depth of the bonds, and the relief and release in the sentences of strength. I often ask a client to speak the appropriate words, silently or aloud, and imagine making, or actually make, the accompanying gestures, for example, a bowing down movement. If it happens that I cannot feel my way into the dynamics of the system, if I have no feeling for the family members represented by the figures or the system dynamics, or if the client remains untouched by my ‘picture’ of the relationship network, then I interrupt the constellation process and gather further information, tell short stories, or simply stop the work. – that you are being influenced by visual patterns and associations and are not finding harmony with the soul. The main shortcoming compared to a group constellation is that a therapist can often get in touch with system dynamics through the sometimes very surprising statements of the representatives. Especially in difficult cases, with new and unfamiliar dynamics, this is critical. For example, if one person in a system is being drawn to leave in place of another, this is often not clear directly from the constellation. It is the statements of the representative that may provide some indication of this dynamic. If a therapist has a suspicion about something of this kind, it is easier to check it out in a group. The energy and participation of the group members observing the constellation also gives important indications about the accuracy of tentative hypotheses. These difficulties, however, are not critical. The dynamics of the client’s ‘group soul’ is not opened by the representatives, but by the client’s soul. In an individual setting you can also feel the power when a hypothesis brings something essential to light. The last criteria is a feeling of harmony and of being touched of both the therapist and the client. This can be quite astounding in a figure constellation. The therapist sees the resolution through a direct awareness of the client. Awareness means taking in what emerges out of the hidden depths. The old Greek work for truth means that which is not hidden from view. The things that untangle and resolve usually come unexpectedly and quietly. They touch, they serve peace, and they favour action. They honour everyone and are beneficial to everyone in the system. Figure constellations also provide an opportunity, when a therapist or counsellor does not feel competent to handle group processes. A group constellation may take on a dynamic of its own which no longer serves the client’s system if it is lacking a clear vision, precise awareness, and a certain quality of leadership from the therapist. A figure constellation also avoids the danger of representatives bringing in their own personal problems. One price for control in this area is that there is less control over the prejudices and blind spots of the therapist, and in an individual setting, a therapist is more vulnerable to the ‘pull’ of the client, which can sometimes be considerable. In group constellations, those who are positioned in the constellation are resonating to the soul of the system. Figures cannot do this. They remain representative objects which function in the mind’s eye. You do not need to ask figures to get out of their roles at the end of the constellation. Figure constellations can be limited to a visual representation, which is how I worked in my first years. The figures provide a visual bridge, a graphic depiction of what is being discussed, a method that perhaps allows for indirect suggestions. All this can be very helpful, but a figure constellation can offer more. It is amazing how quickly it establishes a space for the soul in which the ‘group soul’ can resonate. This resonance is carried over to the therapist and the client. Constellation work is not just working with visual images. It touches and moves because it provides space for the pictures. Spatial pictures are different from flat two dimensional pictures, not only in providing the correct dimensions for relationships, but more importantly, in allowing something to rise up out of the picture, something difficult to describe that is not visible just through looking at a picture. What comes out is something like a resonating field. The client and therapist’s resonance with the ‘group soul’ and its dynamics comes not from the figures, but through the figures. At the same time, the figure constellation supports a therapeutic process that is externalised and leads away from internal thoughts and ideas. It lives closer to reality than simply ‘talking about’. The surprising depth of feelings of being touched do not come just from the constellation. The ‘resonance’ is also connected to words: to words that reflect basic truths, to words that bring clarity, to words of bonding and words of disentangling, to words of love and strength. The deeply moving experiences also arise from gestures, a physical expression of the movements of the soul. Working with figures has an effect in the depths only when it goes beyond the visual aspects to the field of the relationship network, when the power of this field is allowed to penetrate and open the resolving and healing dialogues and gestures. Anyone who is convinced of the deep-reaching processes in family systems and in the soul can also, of course, work towards solutions without constellations, group or figures, just through an awareness of the essential events and fates, and in staying harmony with the soul of the person seeking help in the search for insight. Normally, however, such a method makes the work of the therapist easier and also gives the client access to what is essential and critical. It collects information, structures the procedures and focuses attention. Using constellations, it is easier for the client and therapist to experience being on a path together, open to whatever might emerge from the hidden depths. They join together in the space of the client’s soul, only for as long as necessary to find a resolution. In a figure constellation and an image of resolution, the client experiences something that can be taken home—something that continues to work on in the soul and often only unfolds its full effects over a period of time. Perhaps it is something akin to a theatre performance. Just reading a play can hold me spellbound, but the performance in the theatre is usually a deeper and more impressive experience. This is true, however, only when it remains true to the heart of the play, to reality, and to a transformation in the audience. Weber, Gunthard (Hrsg.) (2000): Praxis des Familien-Stellens. Beiträge zu systemischen Lösungen nach Bert Hellinger. 3., überarb. Aufl. 2000: S. 182–193.